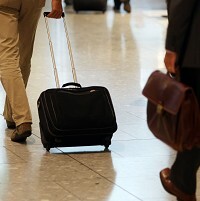 Around one in 10 people are put off air travel by the thought of the hassles they face at airports, a new study shows. In a poll of more than 2000 people, 9% admitted they do not fly because they do not like the airport experience, while two-fifths of those who travel said being at airports leaves them stressed. A third of people find getting around airports more taxing than a working week and 23% find it as tough as a house move. Two-fifths said they find foreign airports difficult. The survey by life assistance company CPP found travellers worried most about flight delays, the likelihood of mislaying baggage and failing to get to the departure gate on time. But having a travel insurance policy in place can help take some of the stress out of the airport experience. Nearly half of those questioned said they have to get on the flight before relief sets in and 45% believe their holiday only starts once the plane leaves the ground.